Sunday Suds: Birra Baladin "Solera"
There's something afoot in Serralunga. In this tranquil hilltop town of only 300 or so inhabitants, there's a sudden surge in renovations, perhaps the result of in influx of new money or maybe just of a revived thirst for renewal. Adjacent to the town's main square and its scenic overlook, major construction is underway at Azienda Agricola Vigna Rionda, where owners/winemakers Franco and Roberto Massolino are adding a floor and a rooftop terrace to create updated, separate accommodations for their winery's trade and public visitors. And not more than three or four hundred meters from there, a short walk down the winding cobbled streets through the town center to the base of Serralunga's old tower, there's something else afoot. 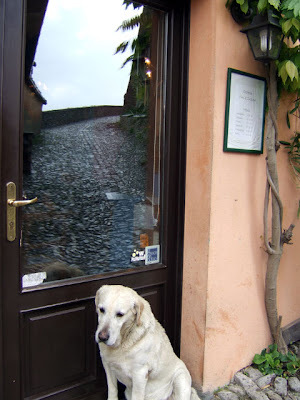 Just past the dog – he actually lives a couple of kilometers away, I'm told, but he's always there – and just through that door lies one of the most lively, inviting café/wine bar combos one could imagine, whether in Serralunga or elsewhere. That place is Vinoteca Centro Storico. 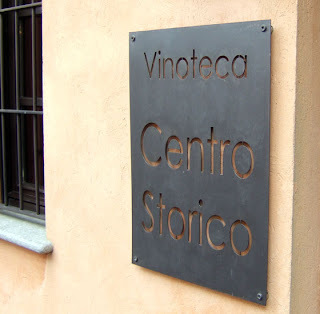 The name couldn't be much more straightforward: a wine bar in the center of the old historic town. Nor could the mission be much simpler. 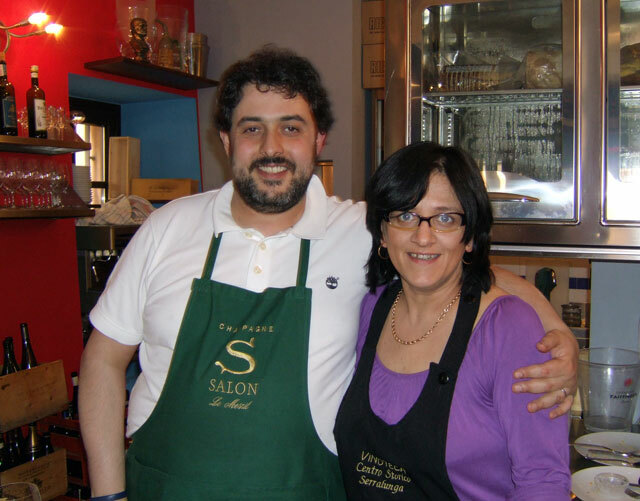 Owners Alessio Cighetti and his wife/partner Stefania turn out what is an essential Piemontese experience, combining the simple pleasures of food and wine and making the pairing accessible to any and all who walk through their doors. 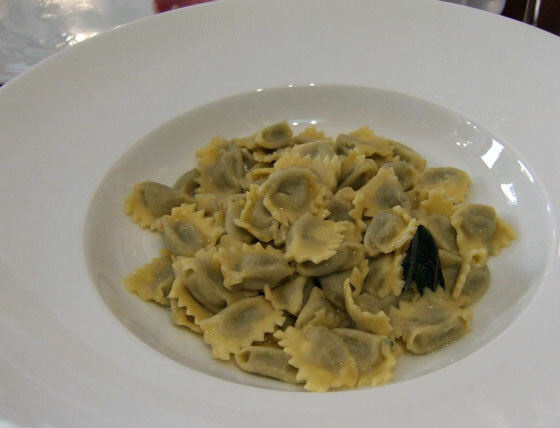 Stefania's food is the essence of simplicity. Think of it as home cooking — consistently good, hearty, classic Northern Italian home cooking — and you're on the right track. 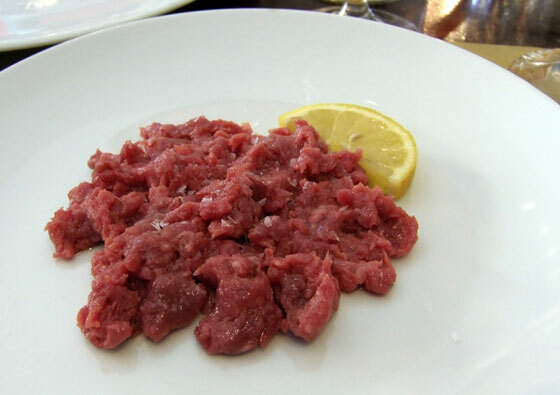 Aside from a couple of hapless grissini, carne cruda pretty much had to be the first dish to meet my gullet on arrival in the Langhe on my recent trip, and Stefania and Alessio were only too happy to oblige. Ravioli in a sage-butter sauce — another Piedmont classic — rounded out my entry lunch. 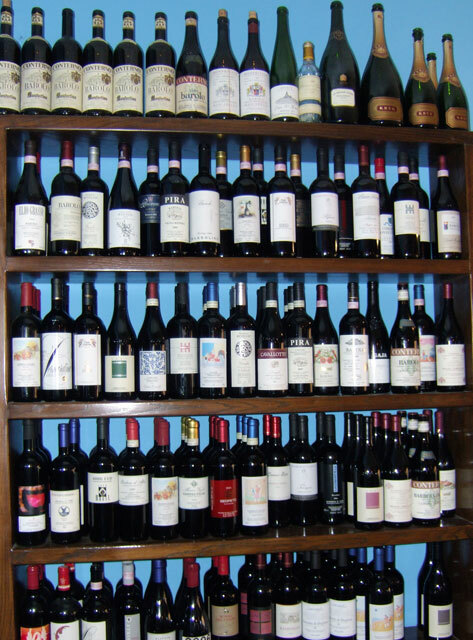 Balancing the simple soulfulness emanating from Stefania's cucina, Alessio has put together a pretty damn satisfying wine list. 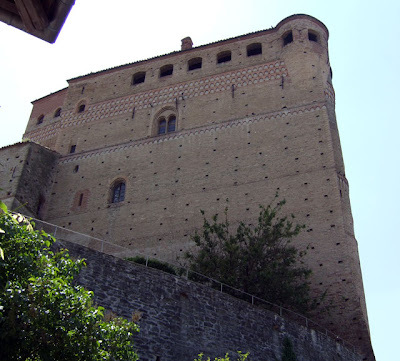 The local offerings aren't anything to snub a nose at, with verticals of Monfortino and other top Baroli offered alongside more humble options in Langhe Nebbiolo, Langhe Bianco and, yes, even French wine. Actually, it's French wine, and a very particular sort of French wine, upon which Centro Storico has really built its equally particular reputation. In this town of less than 300 residents, Alessio sells over 1500 bottles of Champagne a year. He's put together a list that rivals if not betters any I've seen here in the US, with big names such as Salon and Krug resting alongside gravitas-laden options from the likes of Philipponat (a vertical of Clos des Goisses, anyone?) and Diebolt-Vallois, all peppered with hipster-chic offerings from producers such as Cédric Bouchard, Ulysse Colin and Jérôme Prévost. And it's all priced more than fairly, about the same if not a tad less than what you'd pay at retail here in the States. 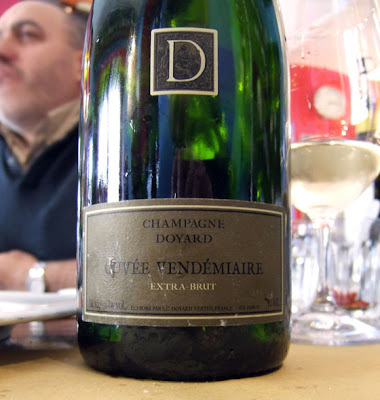 Poured by the glass during my visit(s) was Champagne Doyard's "Cuvée Vendémiaire" Extra Brut, a sumptuously rich Blanc de Blancs from Vertus that displayed the breadth of aroma and body brought on by extended lees-aging. Lovely stuff and, ironically, more or less the first wine to whet my whistle in Nebbiolo-land. There are a mere four or five tables on the ground floor and about the same upstairs, a few more outside when weather permits. 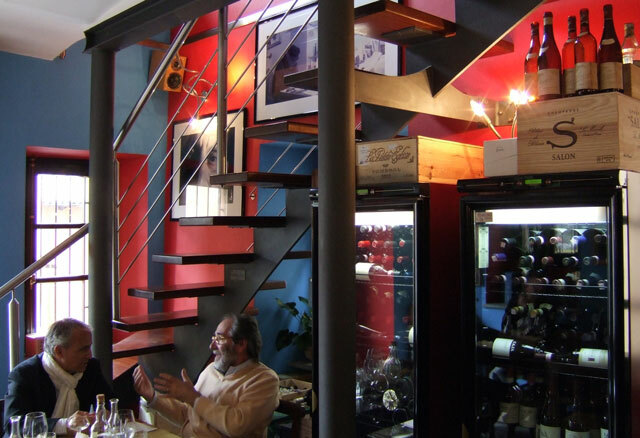 Just enough space to accommodate the mix of wine loving locals, travelers and regional producers who frequent the place. Don't miss it if you're ever (or when you're next) in the area. I came pretty damn close to calling it home base during my stay... and I'm already missing that carne cruda and Champagne combo. David - great post, great place. I see you also enjoyed the carne cruda. We were introduced to Alessio as Ciccio, or "chubby friend"... There was brief talk of a second, NYC location. Did you taste through the Massolino wines? I thought the Vigna Rionda bottlings were absolutely stunning and found the Moscato grown on Serralunga soil to be a revelation. Their Nebbiolo d'Alba was one of the best examples I've had. Franco is a true gentleman and all over the details. 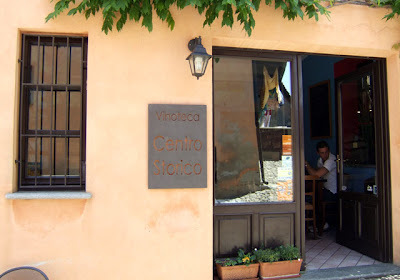 I did visit Massolino and taste through the wines. I'll eventually write up the visit but, if I go according to current plan and write about things chronologically, it may take a while to get there. Franco was indeed a gentleman and obviously very passionate about what he does. His wines didn't show all that well in the blind tastings during Nebbiolo Prima; however, the '04 Barolo Riserva "Vigna Rionda," when tasted at the estate, was one of the finest young Baroli I tasted on the entire trip. Franco really lit up when I said as much; you could see how happy he was with the wine. And yes, the Moscato was rocking. Really sorry we couldn't manage to meet up over there. Next time! Definitely next time. I'm looking forward to hearing which wines you preferred in the blind tasting. I ran into a journalist with a palate I respect and was quite surprised to read his interpretations of some of the wines. I've never been a believer in blind tastings as enjoying wine is so much about context. I can say it does churn up some interesting conversations, which is a great thing. 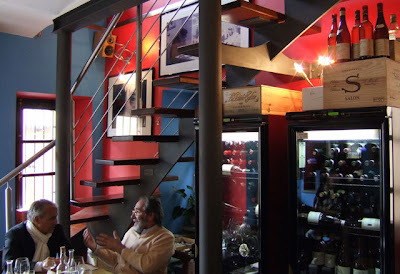 I recently did a wine tour through the Boland area in South Africa and I found it to be the most pleasant experience ever! My wife and I decided to do this kind of thing more often and this blog is a good reference for us! Thank You! The dog's name is Teo, by the way! This place must be packed with Americans. Great post, hope to make it there someday. Indeed, Tom. Thanks for sharing your link. The Doyard was definitely flowing freely over the course of the week. You'd think so, as it seems like just about every American member of the Nebbiolo Prima contingent made it there at one point or another during the week. That said, on all three of my visits I was the only yankee in the house. That looks like Sergio Germano in the back of the one pic? Good call, Mr. Hudson. I stayed at the Germanos' agriturismo for the first three days of the trip, and it was Sergio who first introduced me to Centro Storico.